The Aerospatiale-BAC Concorde supersonic transport (SST) was the only supersonic passenger airliner that has ever seen commercial service. 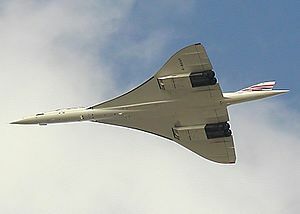 Concorde reached a speed of Mach 2.04 and a cruise altitude of 60,000 feet (18,000 meters) with a delta wing configuration and an evolution of the afterburner-equipped engines originally developed for the Avro Vulcan strategic bomber. Only 20 planes were ever built; 12 remained in commercial service as of April 2003. The final flight of an Air France Concorde took place on May 31, 2003; the final flight of a British Airways Concorde took place on October 24, 2003, from John F. Kennedy airport to London Heathrow. In the late 1950s the British, French, Americans and Russians were all interested in developing supersonic transport. Britains' Bristol Aeroplane Company and France's Sud Aviation were both working on designs; the Type 233 and Super-Caravelle respectively. Both were largely funded by their respective governments as a way of gaining some foothold in the aircraft market that was then utterly dominated by the United States, a long-term goal which seems to have been vindicated by the rise of the European aircraft industry over subsequent decades. The designs were both ready to start into prototype construction in the early 1960s, but the cost was so great that the companies (and governments) decided to join forces, and a draft treaty was signed on November 28 1962. 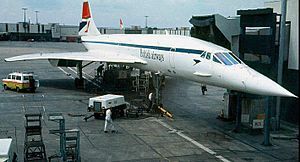 By this time both companies had been merged into new ones, and the Concorde project was thus a part of the British Aircraft Corporation and Aerospatiale. The consortium secured orders for over 100 new airliners from the leading airlines of the era. Pan Am, BOAC and Air France were the launch customers with six Concordes each. Concorde 001 took off for the first test flight from Toulouse on March 2, 1969 and the first supersonic flight followed on October 1. The flight program of the first development aircraft progressed as planned, but trouble was brewing on the commercial side of the project. A combination of factors, including the 1970s oil crisis, acute financial difficulties of the partner airlines, a spectacular failure of the competing Russian Tupolev Tu-144, and environmental issues such as sonic boom noise and ozone depletion in the stratosphere caused a sudden cascade of order cancellations. Air France and British Airways ended up as the only buyers for the plane. All the unsold aircraft and parts were later sold to them for a nominal price. (The US cancelled their supersonic program in 1971; the Boeing 2707 had originally been intended to be faster, double the size, and built to a swing-wing design). Both European airlines operated demonstration and test flights to various destinations from 1974 onwards. Scheduled flights started on January 21, 1976 on the London-Bahrain and Paris-Rio routes. 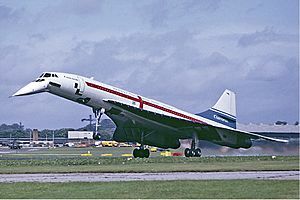 The United States Congress had just banned Concorde landings in the US, preventing launch on the coveted transatlantic routes. 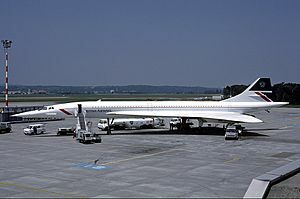 When the US ban was lifted in February, New York quickly followed by banning Concorde locally. Left with little choice on the destination, AF and BA started transatlantic services to Washington D.C. on May 24. Finally, in late 1977, the noise concerns of New York residents gave way to the advantages of Concorde traffic, and scheduled service from Paris and London to New York's John F. Kennedy airport started on November 22, 1977. The average flight time on either route was just under 3.5 hours. Up to 2003, both Air France and British Airways continued to operate the New York services daily. 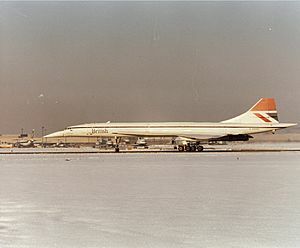 Additionally, Concorde flew to Barbados during the winter holiday season and, occasionally, to charter destinations such as Rovaniemi, Finland. On November 1, 1986, a chartered Concorde circumnavigated the world in 31 hours and 51 minutes. Concorde was considered to be the safest airliner in the world as measured by passenger-deaths per passenger-mile, until a plane crashed during take-off in Paris on July 25, 2000, killing all 113 crew and passengers. 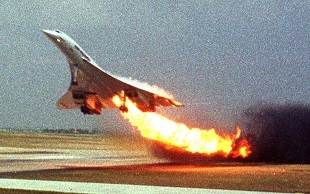 As a result, all Concorde flights were shut down for an investigation into the cause of the crash and possible remedies. After safety updates on the aircraft, both routes were re-opened on November 7, 2001. The investigation into the crash determined that a strip of titanium metal that fell onto the runway from an earlier Continental Airlines DC-10 flight punctured a tire in the latter stages of takeoff. Chunks of shredded tire penetrated the skin of the aircraft's wing, rupturing a loaded fuel tank. A tremendous fire rapidly ensued, disabling the aircraft, which then stalled and crashed into a hotel just miles from the airport, killing all aboard and four persons on the ground. On April 10, 2003 British Airways and Air France simultaneously announced that they would retire the Concorde later that year. They cited low passenger numbers following the July 25, 2000 crash that never fully recovered and rising maintenance costs. That same day Sir Richard Branson offered to buy British Airways' Concordes for £1 per plane for the use of his Virgin Atlantic Airways, but was refused. Air France made its final Concorde landing in the United States in New York City from Paris on May 30, 2003. Trucks sprayed arcs of water above the plane on the tarmac of John F. Kennedy airport. The plane made its final commercial flight back to Paris the following day. British Airways retired its aircraft on October 24 of that year. Christie's conducted an auction of Concorde parts and memorabilia for Air France that November, and British Airways held a similar sale the next year. Air France Concorde on display at Steven F. Udvar-Hazy Center. Concorde Facts for Kids. Kiddle Encyclopedia.